Shahid Afridi retired from ODI cricket after the 2015 world cup in Australia and after Pakistan bowed out of T20 world cup india he is likely to retire from international cricket all together. We take a look at his bumpy but exhilarating career in shorter format since 1996. One of the most feared One Day International player to have graced the game of cricket is Paksitani All rounder Shahid Afridi, inconsistent throughout his career but miraculous at the same time. When he is in form either with the bat or bowl he has the capacity to turn the match around from any point but the problem with him is that he was too inconsistent to be consider a true legend of the game. Today we take a look at some of his ODI and Twenty20 records and analyse his career statistics. Afridi has been playing international competitive cricket since very young age, he was on the tour of West Indies with Pakistan A team in 1996 when injuries to couple of bowlers lead Pakistan team to call him as emergency replacement. He was introduced in ODI cricket as a bowler and played his first game against Kenya. He bowled 10 overs for 32 runs and did not bat in the game which Pakistan won by 4 wickets. An accidental batsman: Pakistan were playing a 4 nation tournament in Kenya where in last group game against Sri Lanka they needed to win big to make it to the finals and Saeed Anwar was the captain of the team. He saw Afridi batting in the nets and asked him to come up the order against Sri Lanka, so he did and rest as they say is history. A 37 ball hundred the fastest at the time and remained till 2014 when Corey Anderson broke the record quite recently. After that the expectations from Afridi’s batting increased rapidly and even Pakistan management got greedy and used him as an opener or top order batsman for next few years. 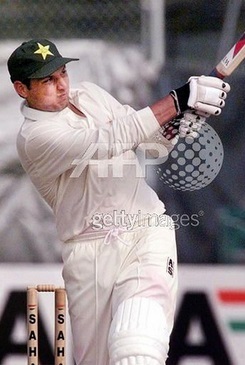 But he was never a proper batsman, more of a pinch hitter and that too a very young one. Afridi had his days as an opener but mostly he struggled against good fast bowling. (but pakistani fans forgot that he was just a bowler who could bat a bit). Afridi focused more on his batting and kind of ignored his bowling skills which got him into the pakistan team at the first place. He was wayward with the ball, not consistent with the line and length so selection committee was kind of confused where and how to use him in the lineup. They kept picking him because of the star status he had but that lead to Afridi being terrible in 1999 and 2003 world cups and only after he was dropped from ODI squad after 2003 world cup he started to think more as an all rounder and worked on his bowling. He was out of the team for around a year but when he made his comeback against India with a 50 ball 84 runs in Sialkot that turned out to be a turning point. After that most of his career he played as a pinch hitter down the order and his bowling improved dramatically. Here are the statistics comparison of his performances in ODI cricket, from 1996 to 2004 and compared with 2005 to 2015. You an see there is not much difference in the batting average from his first 190 odd games to the last 190 games. Since he batted down the order since 2005, his 3732 runs playing at number 7 holds more significance than the 4125 runs as an opener. The major difference ofcourse is in the bowling record, he took just 153 wickets in his first 191 matches which is pretty average for a allrounder but look at his later 198 games where he picked up 237 wickets and thats good stats for even a front line bowler. With the combination of his bowling and sometimes deadly batting he became a proper match winner for Pakistan. There is a direct impact of his performance on the team when he clicks with either the bat or while bowling. When he has a good day pakistan win games (its as simple as that). take a look at the following statistics. The above figure shows that his batting average jump up to 31 in the games pakistan have won and also his performances has been great as a bowler. Which goes to show that he is a match winner. Another statistic which caught my eye was his performance as a captain, he raise his game when handed extra responsibility of a captain. take a look at the following stats. See his batting average jumps to respectable 27 when he played under his own captaincy plus his bowling average also goes down from 34 to 29.88. Now we take a look at his performances against every nation he has played against since 1996. Now we take a look at some of the records Afridi holds in ODI cricket with both bat and bowl. Looking at the statistics first thing comes to mind is that he has kind of under achieved specially in the ODI World Cups so far, but he has his last chance to turn things around when he travel to Australia with Paksitan team as the most capped player in Pakistan ODI history. Afridi held the fastest ODI century record for almost 18 years, he scored a massive 100 of just 37 balls against than world champions Sri Lanka which had bowlers like Muralitharan, Chaminda Vaas etc. Afridi was the Youngest Player to score and ODI hundred in his just second match. He was 16 year old. Not only the fastest hundred he came close to breaking his own record couple of times. He scored a 100 against India in India of just 45 balls and another one against Banglades of just 57 balls. Afridi has scored 2nd fastest fifty in ODI cricket of just 18 balls and he has done 4 times of 18 balls, 2 times of 19 balls and a few more times on 20 and 21 balls. He has 342 sixes to his name in ODI cricket which is by far the most for a player and this is one record which won’t be broken for years to come. Afridi is the only player to have scored a fifty and took 5 wickets in a game on three separate occasions. His bowling performance against West Indies where he took 7 wickets for just 12 runs is the second best bowling record in a match in history of ODI cricket. 3rd Heights wicket taker in ODI cricket from Pakistan. Only player to have scored more than 1000 runs and 80 wickets in T20 international cricket. 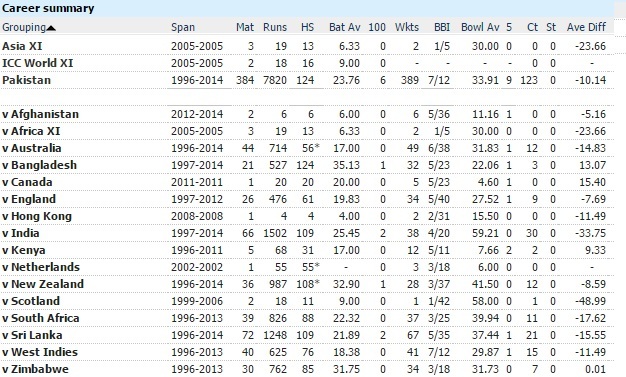 Best bowling figures by a captain in world cup history. There are alot of other records to his name but these were the few I could think off as of now, Afridi is in the twilight of his career and World cup 2015 will pretty much be his last major competition. When you look at his statistics you just can’t help but think what if he played more sensibly he would have become the greatest ODI player ever but for now he is one of the greatest entertainer and a match winner on his day. His inconsistancy has kind of a put mask on his greatness but one thing is for sure we will get another Sachin Tendulkar, another Lara or Wasim Akram, what we won’t get is another Shahid Afridi.